To the mainstream public BitTorrent is best known for its efficient distribution of entertainment, but BitTorrent Inc. and the Khan Academy are showing that it's an excellent tool to spread education too. The pair have launched an App for the millions of uTorrent and BitTorrent Mainline users that gives them instant access to free educational content. The BitTorrent App Studio was launched by BitTorrent last August and features content from selected content providers and software developers. The idea is to offer these publishers a unique distribution platform and to make it easier for the 100 million strong uTorrent/Mainline userbase to find new content from within their clients. BitTorrent Inc. has been slowly adding new apps over the past several months and they just rolled out a new one for uTorrent and the Mainline client. 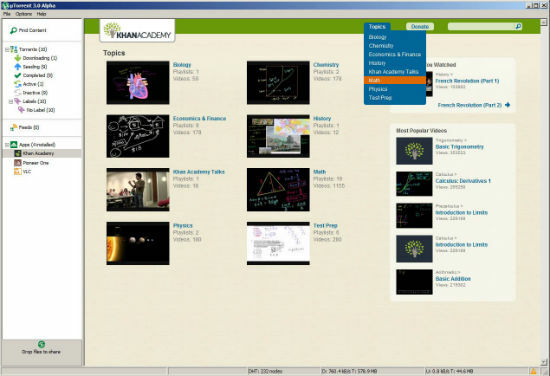 The new app features educational videos from the Khan Academy. With the app, BitTorrent users have easy access to over 2,000 award-winning educational videos, covering a wide variety of topics. “Their technology allows users to download large video files quickly, plus it requires no costly hosting or infrastructure on our end – an important factor for a non-profit,” Khan added. BitTorrent Inc. is equally enthusiastic about their new partnership, which allows them to show off a great ‘legal’ use case to its millions of users. The app is the 19th added to the App Studio, which also includes the Torrent Tweet VLC and uCast apps. For those who are interested in checking out the videos, the Khan Academy app is now available in the App Studio for both uTorrent and the Mainline client.